According to Enterprise Management Associates (EMA), the typical enterprise has between 6 and 10 network monitoring and troubleshooting tools in active use, with even more ‘shelfware’. Furthermore, 10% of large enterprises use more than 25 solutions! Holy cow, that’s a lot of network monitoring tools. With separate monitoring metrics being collected, little to no integration between different monitoring tools, etc., it’s no wonder we can’t talk to each other and war rooms are so commonplace. EMA claims that a whopping 81% of IT organizations regularly leverage cross-domain teams to tackle performance issues. 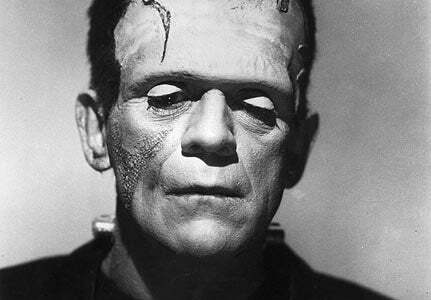 (EMA) We see the results of this Karloff-inspired approach every day in the press where application outages impact air travel, financial management, and even our ability to buy things. To complicate matters even further, enterprises are adopting hybrid, software-defined infrastructure that requires a new approach to IT operations. IT organizations need multidisciplinary, cross-domain teams to operate software-defined datacenter (SDDC) architecture and hybrid cloud. These environments are simply too complex to manage with siloed management systems. The bottom line is that if you haven’t already started to do this, you need to seriously start to think about consolidating and integrating your performance monitoring and troubleshooting tools. Having a unified, blended approach to performance management will give you back the accountability, control and predictability you so desire and require. But how do you move from today’s siloed, domain centric approach to this more integrated one? We think this new release of the Riverbed SteelCentral Platform brings you one step closer to the answer. We’ll expound upon on this in our webinar on November 18th (Click here to register). domain-level analysis that allows you to start anywhere and grow. While SteelCentral offers that different, proactive approach to application performance management, the building blocks are differentiated on a standalone basis. It is modular in nature. You can start anywhere, which means that you can start with any aspect of application performance—network, infrastructure, end-user experience or code-level monitoring—and grow to a unified and blended performance view. You can take a broad view of application performance viewed through the prism of the network, focus on business-critical applications leveraging end-user experience monitoring, or dive deep into application performance with code-level analytics. 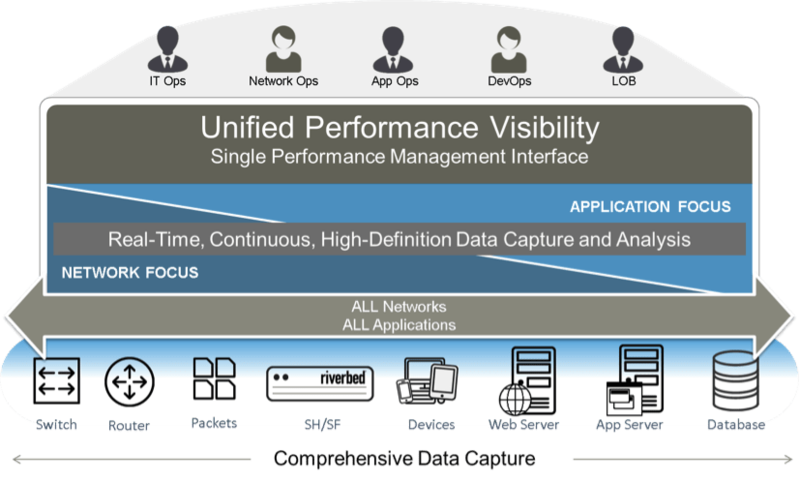 In other words, broadly look at performance visibility across all networks and all applications. To do this, we begin with one of the most comprehensive data capture capabilities in the market. These include the ability to capture data from switches, routers, packets, devices, web servers, databases, and of course, SteelHead and SteelFusion. The SteelCentral platform leverages this real-time, continuous, high-definition data capture and analysis in a single interface to give a blended, unified view of across network, infrastructure, end-user and application performance. Performance views can be leveraged by management to make key business decisions and within functional specialties to plan and troubleshoot day-to-day issues. Here are a few of the most notable recent advances of how the new release is enhancing SteelCentral platform integration at multiple levels. These integrations occur with SteelCentral Portal, between modules, and between SteelCentral and SteelHead. Expanded network and application visibility. This new release of SteelCentral Portal brings major advances in collaborative troubleshooting capabilities, including integrating the physical application network path with existing logical network and application maps. With this you can quickly move between operational views of applications and networks to zero in on the problem areas due to configuration or other infrastructure changes to quickly and precisely identify root cause without the usual finger-pointing between application and network teams. Additionally, the high-end SteelCentral NetShark 6170 now supports up to eight Storage Units for a total capacity of 576TB. This vastly expanded storage is especially useful in today’s high-volume networks, particularly those focused on security or compliance requirements like government, financial services, or healthcare organizations. Superior end-to-end application transaction monitoring. SteelCentral AppInternals now blends network delay data with application transaction analysis metrics, presenting the complete transaction path in a single UI, with contextual drill down. This allows AppOps teams to more quickly diagnose and hand-off network-related problems with the information NetOps teams need to speedily resolve them. AppResponse to troubleshoot the root cause of network issues. More cost-effective application and WAN-optimization monitoring. Today, hybrid IT environments have become the new norm, and companies are increasingly using Riverbed SteelHead to optimize applications running on-premises, in virtual environments, and in the cloud. Accordingly, SteelCentral NetSensor brings enhanced visibility and control for SteelHead environments, enabling customers to monitor the status and availability of SteelHead EX and SteelHead Interceptor devices as a part of their overall infrastructure. Understand it they are performing as they should. You, rather than users, will be the first to know if they’re not. Lastly, SteelCentral AppResponse brings improved performance for end-user experience monitoring of SteelHead-optimized web and SaaS applications such as Office 365 and Salesforce.com. Now just one or two AppResponse appliances can monitor end-user experience in the typical SteelHead environment of 500 or more branches. To learn more, attend our upcoming webinar on November 18th or go to www.riverbed.com/commandcenter.